The DEVELOPER & HOUSEBUILDER YEARBOOK is the must-have reference book used by specifiers, buyers, architects and senior managers throughout the house building, commercial, local authority construction and refurbishment sectors. Aimed and designed specifically for individuals who specify building products and materials for large-scale developments, the yearbook is a unique source of supplier information, trend analysis, market predictions and essential statistics. The book is not only used by every major developer and house builder in the UK, but is sent free of charge to the applicant of every major planning application throughout Britain. This ensures your advertising message reaches not only the major buyers, but also the most active developments: including local authorities, schools, commercial property and housing developments. The majority of building products sold today are ordered by the public and commercial building developers and house building companies. This multi-billion pound marketplace consists of relatively few companies and organisations with the specifiers, architects, project designers, interior architects and buying teams at these organisations needing to stay up to date on industry trends, product innovations and supplier information. The DEVELOPER & HOUSEBUILDER YEARBOOK is designed for these individuals, and is their highly valued reference tool, enabling them to identify and locate the leading suppliers to the sector. 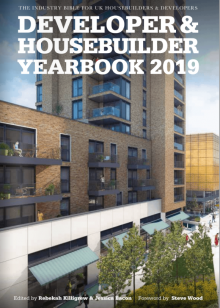 The yearbook is sent free of charge throughout the marketplace and is used by more than 9000 key decision makers at over 3000 house builders and property developers.